Mastoiditis is a bacterial infection of the air cells in the mastoid bone of the skull. Mastoiditis most commonly affects children. Before the use of antibiotics , mastoiditis was one of the leading causes of death in children. As of the early 2000s, it is a relatively uncommon and much less dangerous disorder. 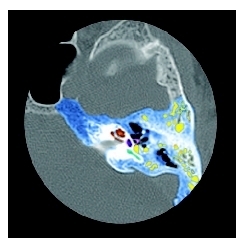 Computed tomography scan (CT scan) showing inflammation and fluid within the air spaces (represented in yellow) of the mastoid. may spread from the ear to the mastoid bone of the skull, which is the bony bump off the base of the skull, located just behind the ears slightly above the level of the earlobe. The mastoid bone is composed of air cells that are in communication with the middle ear. If the air cells fill with infected materials, the mastoid honeycomb-like structure may deteriorate. Mastoiditis has been classified into two types, acute and subacute. Acute or classic mastoiditis refers to acute disease following AOM and involves the development of an abscess behind the ear. Subacute mastoiditis refers to a more chronic disease, often following partial treatment of AOM with antibiotics. In the United States and first world countries, the incidence of mastoiditis is 0.004 percent. Developing countries have a higher incidence of mastoiditis, presumably resulting from untreated otitis media. The highest incidence occurs in infants aged six to 13 months. As of 2004 reports indicated that acute mastoiditis is on the increase. Gram-negative organisms are found more frequently in chronic mastoiditis, and in young infants, which may be due to prolonged antibiotic therapy. The main symptoms of mastoiditis are increasing earache, fever , and the development of redness and swelling behind the ear. The eardrum is inflamed with swelling of the ear canal wall. Mastoiditis typically develops over the few days following an ear infection. This interval is sometimes more prolonged particularly if the initial infection was treated with antibiotics but not completely eliminated (subacute mastoiditis). Children will usually complain of severe pain in the affected ear, which may become swollen. Parents should contact their healthcare provider if a child's symptoms indicate mastoiditis. Appointments with the healthcare provider should also be made if a known ear infection does not respond to treatment or is followed by new symptoms. In addition to a complete medical history and physical examination, the physician inspects using an otoscope the outer ears and eardrums of the child. Diagnosis is established by clinical tests showing bacterial growth in cultures of ear drainage. Pus taken from the ear or sucked out of the abscess with a needle is sent to a laboratory so that the infecting bacteria can be identified. Imaging studies are used to confirm diagnosis. X rays are considered unreliable but can show clouding of the mastoid air cells. A head CT scan or CT of the ear may show a fluid-filled middle ear and an abnormality in the mastoid bone. Audiograms can also be performed to assess hearing loss. Audiogram —A chart or graph of the results of a hearing test conducted with audiographic equipment. The chart reflects the softest (lowest volume) sounds that can be heard at various frequencies or pitches. Gram-negative —Refers tof bacteria that have a cell wall composed of a thin layer of peptidoglycan surrounded by an outer membrane made of polysaccharides and proteins. They take on the red color of the counterstain used in the Gram stain procedure. Mastoid bone —The prominent bone behind the ear that projects from the temporal bone of the skull. Otitis —Inflammation of the ear, which may be marked by pain, fever, abnormalities of hearing, hearing loss, noise in the ears, and dizzy spells. Antibiotics are typically the first course of action in treating mastoiditis. If these do not work, a tube can be inserted to drain off pus or fluid. An incision can be made with the same end purpose. Surgery may also be a recourse, to remove the affected portion of the mastoid bone, to remove a cyst should one be present, and do any further repair required. Mastoiditis is curable with treatment but may be hard to treat and may recur. Acute mastoiditis usually recovers completely after treatment with no long term damage to hearing and no increased risk of further ear trouble later in life if complications have not occurred. Rapid and complete treatment of ear infections significantly lowers the risk of developing mastoiditis. Ear pain is a common complaint from children, but parents should suspect serious ear infection if the ear area is red and swollen. Mastoiditis often causes the ear to be sticking out at an angle. Parents should be aware that ear infections are very common in children, especially those younger than two years of age. Block, Mary A. No More Antibiotics: Preventing and Treating Ear and Respiratory Infections the Natural Way. New York: Kensington Publishing, 2000. Friedman, Ellen M., et al. My Ear Hurts: A Complete Guide to Understanding and Treating Your Child's Ear Infection. Collingdale, PA: DIANE Publishing Co., 2004. Schmidt, Michael. A Parent's Guide to Childhood Ear Infections. Berkeley, CA: North Atlantic Books, 2004. Khan, I., and F. Shahzad. "Mastoiditis in Children." Journal of Laryngology Otology 117, no. 3 (March 2003): 177–81. Nussinovitch, M., et al. "Acute mastoiditis in children: epidemiologic, clinical, microbiologic, and therapeutic aspects over past years." Clinical Pediatrics (Philadelphia) 43, no. 3 (April 2004): 261–67. Robinson, R. F., et al. "Increased frequency of acute mastoiditis in children." American Journal of Health-System Pharmacy 61, no. 3 (February 2004): 304–06. Taylor, M. F., and R. G. Berkowitz. "Indications for mastoidectomy in acute mastoiditis in children." Annals of Otology, Rhinology, Laryngology 113, no. 1 (January 2004): 69–72. American Academy of Otolaryngology—Head and Neck Surgery Inc. One Prince St., Alexandria VA 22314–3357. Web site: http://www.entnet.org. American Hearing Research Foundation. 55 E. Washington St., Suite 2022, Chicago, IL 60602. Web site: http://www.american-hearing.org. Better Hearing Institute. 515 King Street, Suite 420, Alexandria, VA 22314. Web site: http://www.betterhearing.org. "Mastoiditis." Available online at http://www.healthscout.com/ency/43/483/main.html (accessed October 20, 2004).